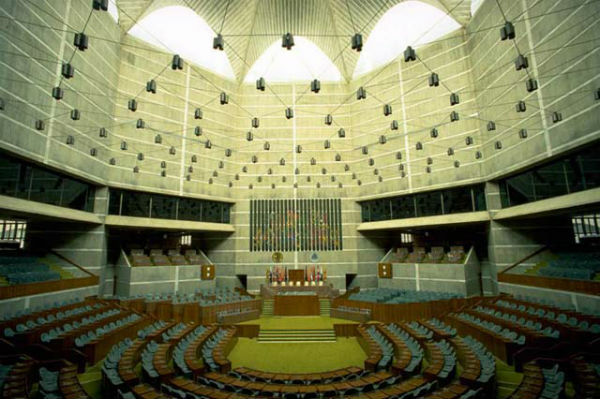 Sitting on the sofa, you flip through Modern Architecture. ̶ That, Marietta, is one of my favorite buildings. ̶ Because of its solemn beauty. And because of the story behind it. ̶ What story? Tell me! I caress your cheek with the back of my fingers. I pivot my legs over the armrest and lay my head on your lap. ̶ There was an old crow, sat upon a clod. That’s the end of the story, thank God. Now kiss me! It comes, the silk of your hair, caressing my skin, making me aspire to knowing. And then with your hair you whip me. ̶ I want to know the story (swish, swish, swish!) of that building (swish, swish, swish!) so tell it to me (swish!) now! ̶ All right, Marietta, I will. I sit up and reach for a book on the coffee table. ̶ Look, here’s a whole book on that building. You lean your body against mine. 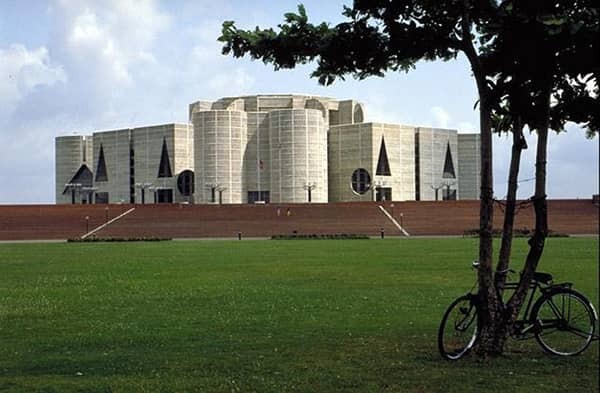 ̶ In fact, it’s a series of buildings, covering almost a thousand acres, that make up the capital complex of Dhaka. 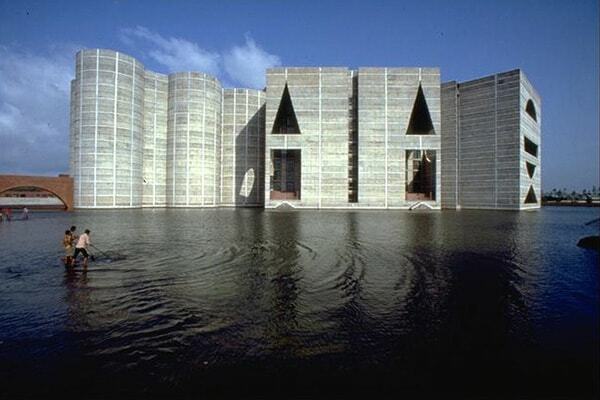 ̶ The architect was Louis Kahn, a man who found that you cannot depend on human relationships, that work is the only thing you can count on. ̶ So he worked himself to death! My hand on the page was empty: Your words have filled it with ash. Not the ash of those who’ve worked themselves to death, but the ash of the dead in a plane crash. ̶ Maybe. He was found dead at Penn Station in New York City, dead of a heart attack. He’d just returned from Dhaka. ̶ It took the police three days to identify him, because he’d erased his address from his passport. Maybe he didn’t know where his home was anymore. ̶ He was a flawed genius, the kind of person I’m attracted to. I don’t like perfection. And thus I told you the story of this magnificent architect, of the ache that living procured him, of his family secrets and crumpled suits. 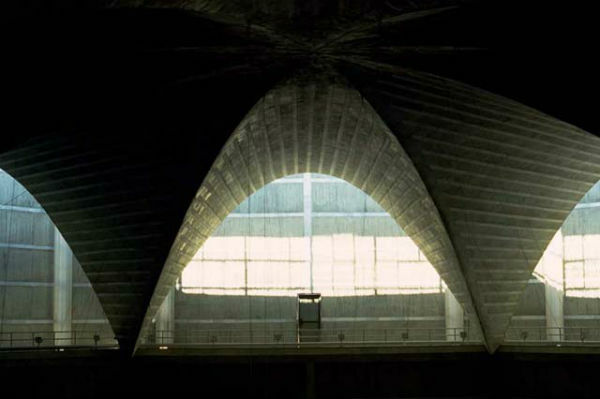 As we flipped through the book, examining the buildings, I pointed out the slits and chutes, the arches and skylights, that let the light in; the artificial lake that accentuates the verticality of the Hall and keeps the land from flooding; the deep geometric cutouts—the triangles, circles and squares you’d noticed—that protect the windows and provide shelter from the rain. Soft, soft, your fingertips caress my cheek, letting me know you’ve made the connection with Jagrati. ̶ …so complex and yet so simple. ̶ Yes. And it was all built by hand. Look, thousands of workers, each carrying a basket of cement on their head, climbing up and down bamboo scaffolding. ̶ You see this joint? ̶ It’s a recessed joint, six inches high, and recurs every five feet. Kahn had determined that five feet was the tallest practical dimension for one day’s work: That became the standard vertical unit of the whole building. ̶ How did you become so interested in architecture? ̶ Toronto City Hall. It’s so beautiful, so well-conceived. And then there’s philosophy. ̶ Yes. Architects are philosophers. At least the best ones are. 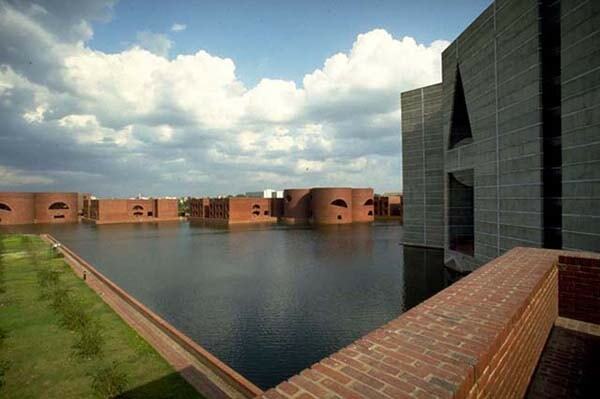 They have an integrated vision of all the parameters of human experience their buildings must express. ̶ Yes, I imagine they would have to. ̶ And because of that, architecture changes our perception of the world, our picture of reality, and with it, reality itself. ̶ But that applies to all art, wouldn’t you say? ̶ Yes. 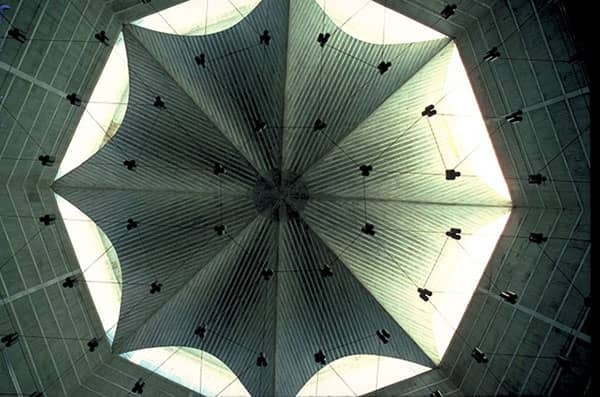 But architecture does it at the same time as it creates something useful and enduring. It touches thousands, even millions of people. ̶ And you, would you like to touch thousands, even millions of people? ̶ No. Just one: You! You close the book on my lap and toss it onto the coffee table. Ay-up! In a flash you’re sitting astride me, pinning my shoulders to the backrest, driving my head over the edge. You press your mouth to mine: Architecture only begins once all the functions have been fulfilled. And then you deepen your teaching: As your hands hold my head, your tongue drives home the lesson: It is constraint that enables freedom. ̶ Carry me to your bed! A man in my shoes carries you, for in my heart I’m already in heaven.